The Arvicolinae are a subfamily of rodents that includes the voles, lemmings, and muskrats. They are most closely related to the other subfamilies in the Cricetidae (comprising the hamsters and New World rats and mice). Some authorities place the subfamily Arvicolinae in the family Muridae along with all other members of the superfamily Muroidea. Some refer to the subfamily as the Microtinae or rank the taxon as a full family, the Arvicolidae. The Arvicolinae are the most populous group of Rodentia in the Northern Hemisphere. They often are found in fossil occlusions of bones cached by past predators such as owls and other birds of prey. Fossils of this group are often used for biostratigraphic dating of archeological sites in North America and Europe. The most convenient distinguishing feature of the Arvicolinae is the nature of their molar teeth, which have prismatic cusps in the shape of alternating triangles. These molars are an adaptation to a herbivorous diet in which the major food plants include a large proportion of abrasive materials such as phytoliths; the teeth get worn down by abrasion throughout the adult life of the animal and they grow continuously in compensation. Arvicolinae are Holarctic in distribution and represent one of only a few major muroid radiations to reach the New World via Beringia. (The others are the three subfamilies of New World rats and mice.) Arvicolines do very well in the subnival zone beneath the winter snowpack, and persist throughout winter without needing to hibernate. They are also characterized by extreme fluctuations in population numbers. Most arvicolines are small, furry, short-tailed voles or lemmings, but some, such as Ellobius and Hyperacrius, are well adapted to a fossorial lifestyle. Others, such as Ondatra, Neofiber, and Arvicola, have evolved larger body sizes and are associated with an aquatic lifestyle. The phylogeny of the Arvicolinae has been studied using morphological and molecular characters. Markers for the molecular phylogeny of arvicolines included the mitochondrial DNA cytochrome b (cyb) gene  and the exon 10 of the growth hormone receptor (ghr) nuclear gene. The comparison of the cyb and ghr phylogenetic results seems to indicate nuclear genes are useful for resolving relationships of recently evolved animals. As compared to mitochondrial genes, nuclear genes display several informative sites in third codon positions that evolve rapidly enough to accumulate synapomorphies, but slow enough to avoid evolutionary noise. Of note, mitochondrial pseudogenes translocated within the nuclear genome complicate the assessment of the mitochondrial DNA orthology, but they can also be used as phylogenetic markers. Sequencing complete mitochondrial genomes of voles  may help to distinguish between authentic genes and pseudogenes. Ellobius, Prometheomys, and Lagurus are among the most basal arvicolines. Dicrostonyx, Phenacomys, and Arborimus may form a clade. Microtus sensu lato contains Alexandromys, ‘Neodon’, Mynomes, Lasiopodomys, Terricola, and Microtus sensu stricto. Ondatra and Dinaromys positions are uncertain, probably compromised by the convergent evolution of morphological characters. Some authorities have placed the zokors within the Arvicolinae, but they have been shown[by whom?] to be unrelated. Skull of a bank vole: Note the distinctive molar pattern characteristic of arvicolines. 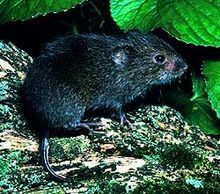 The subfamily Arvicolinae contains ten tribes, seven of which are classified as voles, one as lemmings, and two as muskrats. ^ Steppan, S. J., R. A. Adkins, and J. Anderson. 2004. Phylogeny and divergence date estimates of rapid radiations in muroid rodents based on multiple nuclear genes. Systematic Biology, 53:533-553. ^ McKenna, M. C. and S. K. Bell. 1997. Classification of Mammals above the Species Level. Columbia University Press, New York. ^ Klein, Richard (2009). The Human Career: Human Biological and Cultural Origins. London: The University of Chicago Press. p. 25. ISBN 978-0-226-43965-5. ^ Myers, P., R. Espinosa, C. S. Parr, T. Jones, G. S. Hammond, and T. A. Dewey. 2006.; "The Diversity of Cheek Teeth" ; The Animal Diversity Web (online). Accessed November 26, 2011 at http://animaldiversity.org. ^ Conroy CJ, Cook JA. 1999. MtDNA evidence for repeated pulses of speciation within arvicoline and murid rodents. J. Mammal. Evol. 6:221-245. ^ a b Galewski T, Tilak M, Sanchez S, Chevret P, Paradis E, Douzery EJP. 2006. The evolutionary radiation of Arvicolinae rodents (voles and lemmings): relative contribution of nuclear and mitochondrial DNA phylogenies. BMC Evol. Biol. 6:80. ^ Triant DA, DeWoody JA. 2008. Molecular analyses of mitochondrial pseudogenes within the nuclear genome of arvicoline rodents. Genetica 132:21-33. ^ Lin Y-H, Waddell PJ, Penny D. 2002. Pika and vole mitochondrial genomes increase support for both rodent monophyly and glires. Gene 294:119-129. ^ Robovsky J, Ricánková V, Zrzavy J. 2008. Phylogeny of Arvicolinae (Mammalia, Cricetidae): utility of morphological and molecular data sets in a recently radiating clade. Zool. Scripta 37:571–590. This page was last edited on 4 February 2019, at 00:51 (UTC).